Sooo, we have a little bit of an oreo thing going on at the moment. 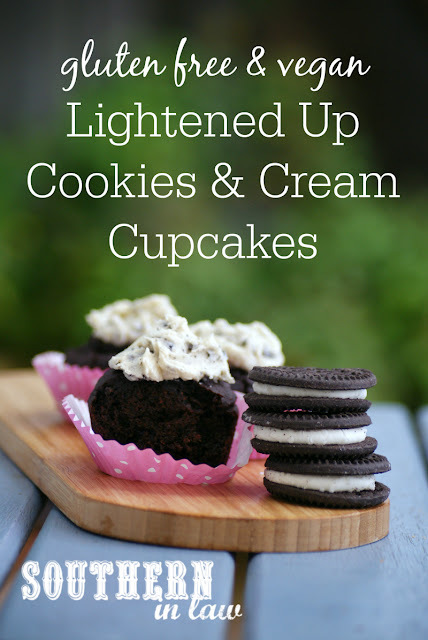 It all started with our Lightened Up One Bowl Oreo Brownies Recipe which convinced Jesse that oreos have a place other than simply in a glass of milk. Those brownies convinced him that oreos were indeed a worthy addition to any baked good - so he let me put them in other things. 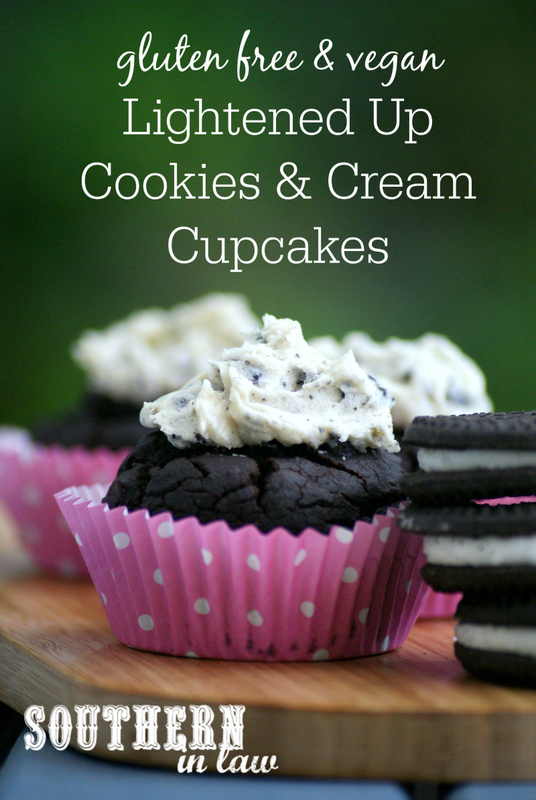 We've been experimenting with lots of different oreo recipes, however, this one has to be a standout. These cupcakes takes ridiculously decadent - but they have a secret. Not only are they lower in fat, sugar and calories - they're also gluten free and vegan. 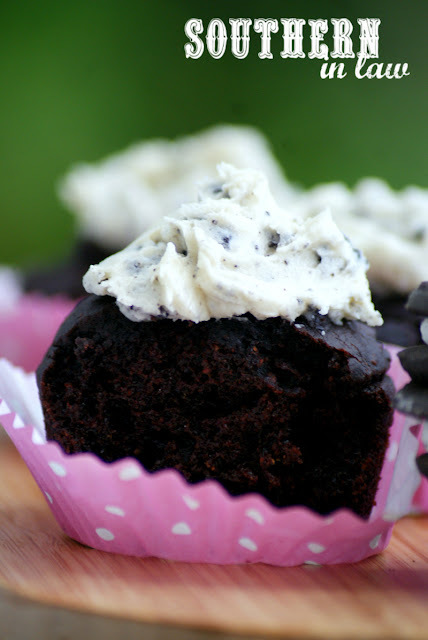 The frosting isn't so healthy, however, it is still vegan and a little bit goes a long way so you can still indulge in a cupcake guilt free (though, I think every food should be eaten guilt free!). 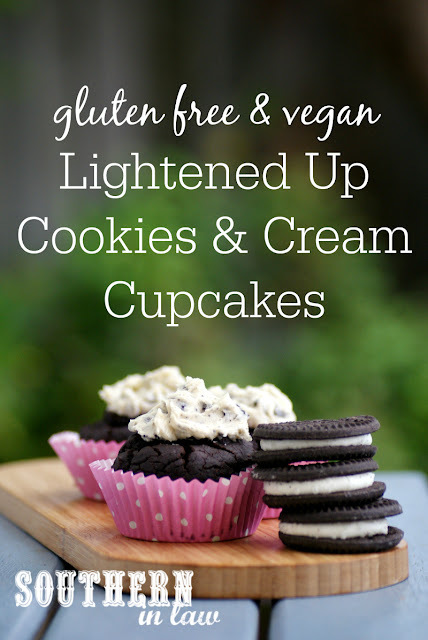 The cupcakes are soft and moist and fluffy and all sorts of cupcake heaven whilst the frosting is creamy and filled with chunks of (gluten free) oreo pieces. But er... if you want to put this frosting through a piping bag, I'd suggest not making the cookie pieces as chunky as the ones in the photos. But whichever way you choose to do your frosting, it's guaranteed to be delicious - and these cupcakes suit a huge range of intolerances and allergies, making them perfect for parties! Grease and/or line your cupcake tins and set aside. In a medium mixing bowl, combine your milk and apple cider vinegar and leave to sit for a minute or so. It will curdle, however, this is what you want! Add your melted butter/oil, vanilla, sugar and cocoa to your milk mix and stir until combined. Add your flour, baking powder and salt to your wet ingredients, mixing until just combined. Spoon your cupcake mix into your cupcake tins, filling 3/4 of the way full. We got 10 in a standard cupcake tin, however, the number will depend on the size of your tins. Bake for 15-18 minutes, or until your cupcakes are cooked through and a skewer inserted into the centre removes clean. To make the frosting, beat your butter and icing sugar in an electric mixer until light and fluffy, scraping the sides down inbetween to ensure everything is incorporated. Crush your oreo cookies finely (if using a piping bag) and gently stir through your frosting before frosting your cooled cupcakes! You can use a piping bag or simply use a knife to put the frosting on top! **Use up to half a cup of sugar if you like things extra sweet! But tell me, do you have a current obsession? It could be a food, a tv show, a hobby or something completely random - I want to know!